If you’re thinking about celebrating Lunar New Year in Taiwan, you are in for a treat! You might catch a glimpse of fireworks as your plane lands in Taipei or see hundreds of beautiful sky lanterns launch with a cheer. The biggest festivities happen in Pingxi, an old mining district, and you can head there anytime in the weeks leading up to actual Lunar New Year to see sky lanterns soaring through the air. 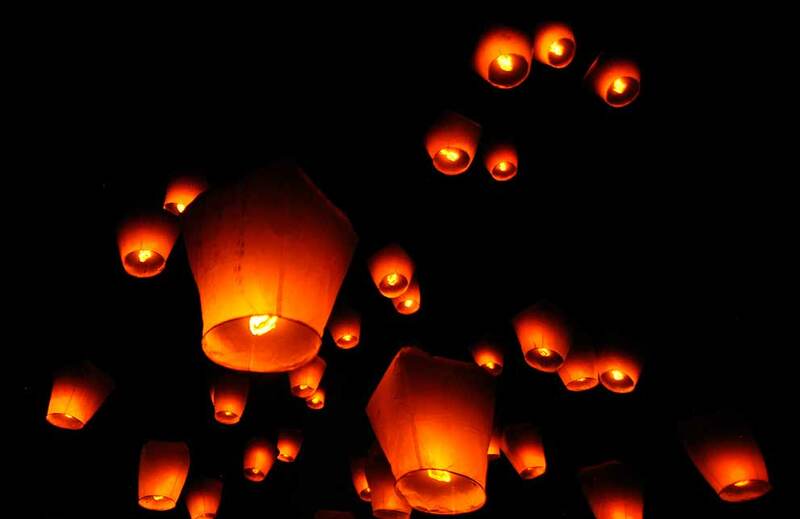 The sky lanterns were traditionally released as a way to let others know the town was safe. Today the country celebrates Lunar New Year here with a wonderful cultural festival. Do you need to speak Chinese to enjoy a Chinese New Year in Taiwan? 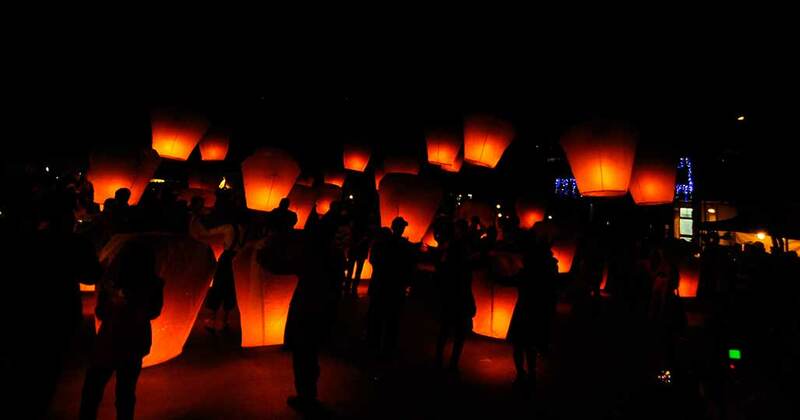 Where are the Sky Lanterns in Taiwan for Lunar New Year? Lunar New Year, known in much of the world as Chinese New Year, also means that both local Taiwanese & Chinese will be visiting places like Taipei and Pingxi for the world-famous festival so be prepared for a large crowd. If you don’t speak Chinese (Mandarin) then you’ll find out just how useful a smartphone can be. Be sure to download the Google Translate language pack before you go to Taiwan! Other than the crowds Taiwan itself has been lovely. In just a few days you can easily stop at the Pingxi lantern festival and explore the beautiful east coast. I decided to Couchsurf and found it to be very fun and easy. The local Taiwanese are super friendly and have been nothing but smiles for foreigners, my Couchsurfing hosts were very happy to take me to the festival and show me around. Although there are many indigenous languages in Taiwan, the common language is Mandarin. You won’t NEED it to enjoy Lunar New Year in Taiwan but speaking a little will help you get around and let you enjoy a more local experience. Hand signals and body language are a must but if you want to interact a bit more with the locals than consider getting this survival Chinese Guide . Lonely Planet Guides are free on KindleUnlimited! Lonely Planet always has a few pages of travel-related translations at the back to help you get around. 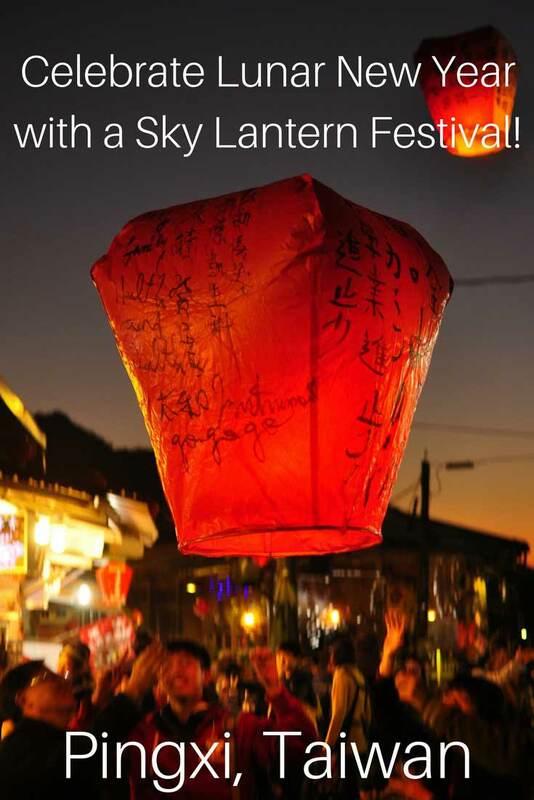 If you’ve done your Googling then hopefully you’ve discovered that Pingxi is home to an incredible sky lantern festival. The celebration actually takes places over a few days and sometimes even weeks. You can sign up to launch a lantern at any of a handful of events held at schools in the area. Unless you hire a tour guide or translator to do this for you chances are you won’t be able to participate but it’s still a wonderful experience to watch 100 lanterns launch skyward all at once! Protip – Sign up for Couchsurfing and you can meet someone who will help translate for you for free! Many Taiwanese are happy to practice their English and show a foreigner their beautiful country. I’ve had the chance to celebrate Lunar New Year in a few countries and I think Taiwan does it the best of anywhere I’ve visited. 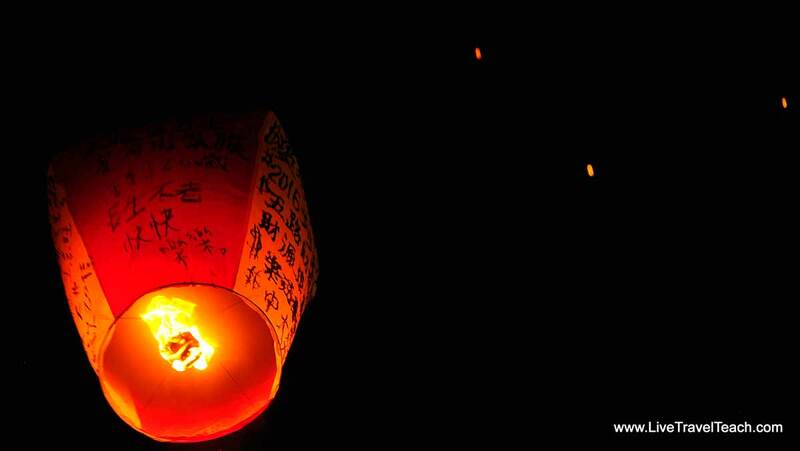 The lanterns are beautiful and you can easily enjoy a few days Taipei before or after the holiday. Almost every town in the Pingxi district will have a street fair where you can try an assortment of crazy foods but more importantly, there are vendors selling lanterns for you to decorate and launch. They will help you write whatever you want and have translations of all their various symbols denoting which ones will lead to luck, money, love or whatever you desire. Although I loved watching the lanterns fly I decided NOT to launch my own because I didn’t want to add to the pollution that this celebration generates. 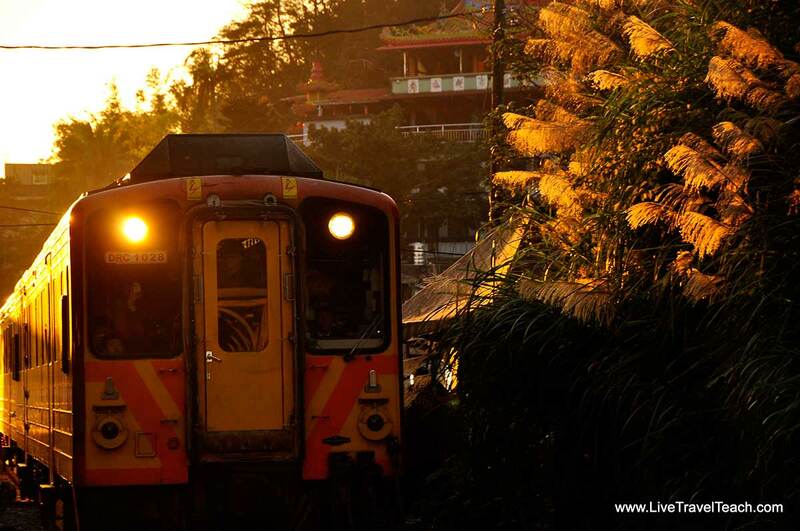 All travel comes with its share of risks. Whenever I travel I buy travel insurance with World Nomads to keep me and my family safe. Whether you pick World Nomads or not make sure you are insured while on vacation. Click the box below and see how affordable it is with an instant quote! If you decide to celebrate the new year in Taiwan then I hope you enjoy the festival in Pingxi. Be sure to schedule some extra time for a quick hike to Shifen Waterfall. Okay, maybe hike isn’t the right word, it’s more of a forest stroll along a well-built path. You can easily catch a cab from the festival to the entrance and enjoy a 30-minute riverside stroll to this magnificent deluge. Shifen Waterfall is straight out of a storybook with gorgeous greenery encasing one of the most beautiful waterfalls. 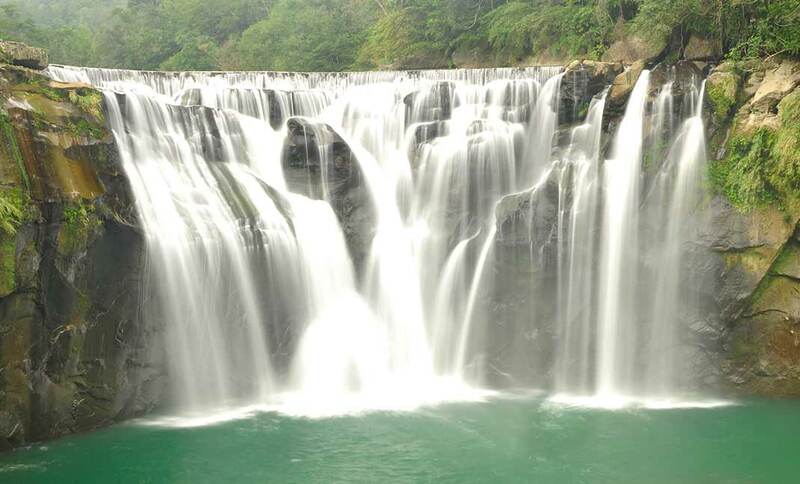 At 66 feet high and 130 feet long it is the widest waterfall in Taiwan too. Looking for other things to do in Taiwan? Visit Jiufen, the old mining town that Miyazaki’s Spirited Away was modeled after. Remember how I said that Taiwan gets crowded for Lunar New Year? Well, that means you’re going to want to book your accommodation as soon as possible! The nice thing about Taiwan is that it’s quite small and easy to get around. You can easily visit Pingxi, Jiufen or Wulai in a day trip from Taipei. If you have time then why not spend a night in each place! Don’t forget to get down to Hualien and explore Taroko Gorge too. Pingxi – Lingjiao Station Guest House is right near the action in Pingxi and their friendly staff are sure to help you plan the smaller details and give you an info about the New Year Fair that you need. 4 Person room for $120/night making it great for a group! Jiufen – Sunny Room is perfect for any couples heading to Jiufen. Their staff is some of the best but even better is the magnificent view from the sun deck. At $109/night this spot is perfect for a couple. Wulai – Hotel Full Moon Spa has a stunning river view and some of the best spas you can ask for. With rooms getting as high as $700/night in Wulai Hotel Full Moon Spa is a steal at $175/night! Hualien – 23 Here B&B is just the spot for you in Hualien. Stay here before you trek in Taroko Gorge and don’t forget to indulge in their free breakfast! All for just $99/night. If you enjoyed this post please share it by clicking the buttons on the left. Don’t forget to the image below on Pinterest!